Police in Germany say four people have been contaminated with polonium-210, the substance used to poison the former KGB agent Alexander Litvinenko. German officials have confirmed that Dmitry Kovtun's ex-wife, her partner and two children have been contaminated with the radioactive substance. Mr Kovtun met Mr Litvinenko in a London hotel the day the former spy fell ill. Meanwhile, a British detective has arrived in Hamburg to be briefed on the investigation by German police. And a second contact is thought to have met British police in Moscow. It has been reported that British detectives and officials from the Russian Prosecutor General's office interviewed ex-KGB bodyguard Andrei Lugovoi, who is currently in hospital. A car, understood to be used by Mr Kovtun, has tested positive for the radioactive substance polonium-210. German authorities say Mr Kovtun arrived in Hamburg on 28 October, and stayed at his ex-wife's flat before flying to London. He met Mr Litvinenko at a hotel in London on 1 November. 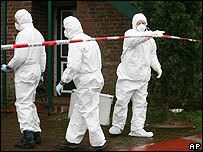 Hamburg police say it is not yet clear whether Mr Kovtun is a victim or a suspect in the case. The former KGB bodyguard is understood to be having treatment for radiation poisoning at a hospital in Moscow. Meanwhile, friends of Mr Litvinenko have said they are unlikely to help Moscow's inquiry into Mr Litvinenko's death. Alex Goldfarb said they did not "trust" a Russian investigation and would help only if they were given assurances by British authorities about their safety. His comments came as it emerged that Russian investigators are to travel to London to question witnesses. Mr Litvinenko's widow earlier said she would not assist the Russian inquiry. 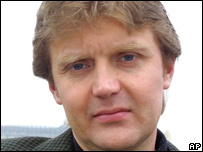 Mr Litvinenko, 43, died in a London hospital on 23 November - it is suspected he was poisoned by polonium-210. Friends of Mr Litvinenko believe he was poisoned because of his criticisms of the Russian government since defecting to the UK, but the Kremlin has dismissed suggestions it was involved in any way.